In my project light through Allah I was inspired by the things we studied in MEST and how Art can be a movement and can say a lot about what’s happening in the world. And how powerful Art is when is used in the right ways. As we studied in MEST different kinds of calligraphy, we also practiced the Square Kufic Style on the word Allah in class. And that got me thinking of a project to do with this technique or style. So I thought of mixing two of forms of art that we studied in the course. First when we were shown Julien Breton who is also known as EL KALAM, who used light and calligraphy and motion in his works. So I came up with an idea to describe our inner peace and how it should be in an artistic way using light and square Kufic calligraphy. 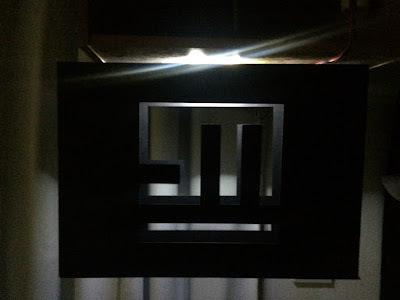 So I made a box like structure and carved in its face and back the word ALLAH in the square Kufic style as inspired. And I installed a light source inside. I used black boards to make my structure to represent that even in our worst cases and our worst moods when we are filled with hate or anger. We should have inner peace. And I show that through the carving that I have in my structure. So its like to say our inner peace is through ALLAH as you see the light through the word. And those who don’t have ALLAH in their lives and their mind, they wouldn’t have inner peace. The light in my project of course represents the peace that we should have. And through Allah we will have this peace even if our lives are filled with wrongs.